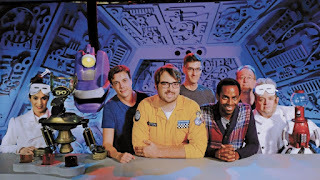 As many of my tens of loyal fans might know, I’m a big Mystery Science Theater 3000 fan (a.k.a. MST3K). I’m not a knows-every-riff-in-every-episode-type fan, or even a donated-to-the-MST3K-reboot-kickstarter-type fan (I’m not exactly making a fortune blogging), but I am a still-has-episodes-recorded-on-VHS-somewhere-in-my-mother’s-overpacked-storage-type fan. The new MST3K reboot came out on Netflix last Friday, and most people seem pretty happy with it. Honestly, I was a little apprehensive—especially because I’m a biased-as-hell Minnesotan who likes the midwestern heavy-handedness of the humor in the original show—but of course I gave it a try. I’ve watched one episode and it was… okay? It wasn’t bad, but it didn’t exactly knock my zubaz off either. First of all, you can tell it was made by a big crew in LA and not by a handful of doughy Minnesotans in Hopkins, MN, like the original. There’s a lot more production involved, which is welcome in some areas (like the nice opening sequence with Har Mar Superstar and a band dressed up as skeletons singing the theme song), but completely unneeded in others (seriously, we don’t need Tom Servo flying around the theater). The cast and crew are much bigger too, as you don't see characters pulling double-duties as mads and puppets anymore. There are also apparently going to be frequent cameos from famous-type people too, including Jerry Seinfeld (who is admittedly an old friend of creator and current writer Joe Hodgson’s, so okay, whatever). The most famous cameo back in the original series was Vikings running back Robert Smith, because the Vikings used to practice next door to where they shot the show and often watched or something. He just happened to be around and willing to do it. However, the first cameo in the first episode of the reboot was probably one of the funniest parts of the episode to me, so fine. The actual most annoying Californian stuff is the over-acting and speed-talking. Jonah Ray and the others just seem over eager to be taking part in the experiment. Totally understandable. 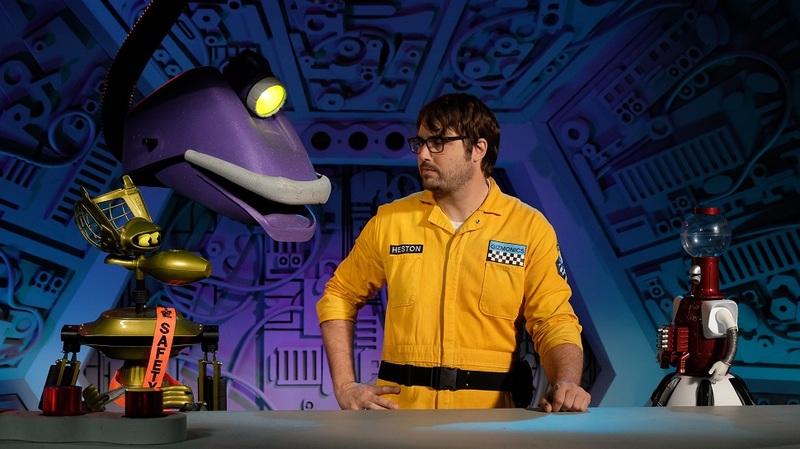 After all, they’re rebooting MST3K—the best TV Show EVER!!!!! But in the actual show, they aren’t supposed to be so upbeat and enthused about watching and making fun of these bad movies. The riffing is not quite as dry and passive aggressive as the original, and those hallmarks of Midwestern humor were part of the reason I so enjoyed the show. Rats. It did seem like there were a couple of attempts to incorporate part of the show’s old Midwestern roots, but they all fell flat. Gypsy—who has an entirely new and different voice (that I actually quite like)—is explicitly supposed to have a Midwestern accent, but as a Midwestern myself, the accent is so faint I can’t even hear it. Also at one point during the movie, a blonde Danish family was attacked by a monster and one of the characters (their voices are still hard to tell apart) quipped, “It’s attacking a Minnesotan family!” Hey—I’m all for making fun of pasty Minnesotans, but the joke felt shoehorned into the show and wasn’t funny as a result. Plus, less than a minute later, one of the characters made a riff referencing Duck Duck “Goose”, which felt like they were purposely trying to piss off every fiber in my admittedly overly fibrous Minnesotan body. But yeah, I’m biased and picky. At times Jonah and the robots talk too fast and try to fit too many riffs in that you can’t digest them. I’m hoping that gets better with time. I've heard the second episode is better, and despite my mostly minor qualms, I'm looking forward to watching it. P.S. — They did a fan mail segment and it sucked because it was obviously fake fan mail. How was it obviously fake? No one sends actual letters anymore, much less 8-year-olds to a show before it even makes a first episode. The fan mail in the original show was real and that’s what actually made it so funny. Please don’t try to recreate that artificially.